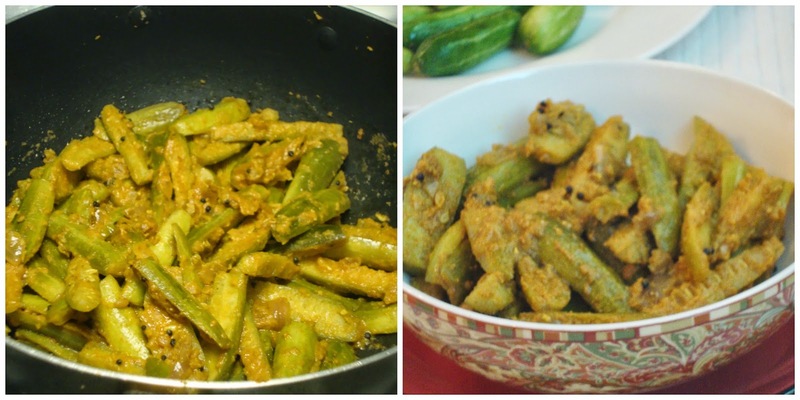 Kovakkai Varuval is a tasty & spicy stir fry that goes well with rice and chapathi. I tried this dish recently after knowing the health benefits of this vegetable and it has becomes a instead hit. Try this and I am sure you will like it! Wash and cut the kovakkai / tindora lengthwise and keep aside. Grind coconut, tomato and fennel seeds into fine paste by adding little water. Heat oil in a kadai and season it with mustard, urad dhal and curry leaves. Once it splutters; add onion and fry till it becomes translucent. Add the kovakkai, spice powders and salt. Give it a mix. Now add grounded coconut tomato paste and saute for a while. Add water till it get immersed and close the pan with the lid. Cook till it becomes soft and water dries up. Switch off the gas. Serve hot with rice paired with any gravy or even with chapathi it taste good. Adjust red chilli powder amount according to your taste. Your kovakkai fry also looks very good, will try this masala with tomatoes..